Hello all you all! I sat down & recorded a summer chat podcast just to keep in touch with everyone. In it I talk about our Jelly Roll Race Day with the guild. Currently need a tiny bit of time to put together a few things on the blog to correspond & at least one listen through. Look for it pretty soon (within the next few days probably?) Course it doesn’t help that the next 3 days after work are pretty much booked up solid. Take care & talk to you soon! 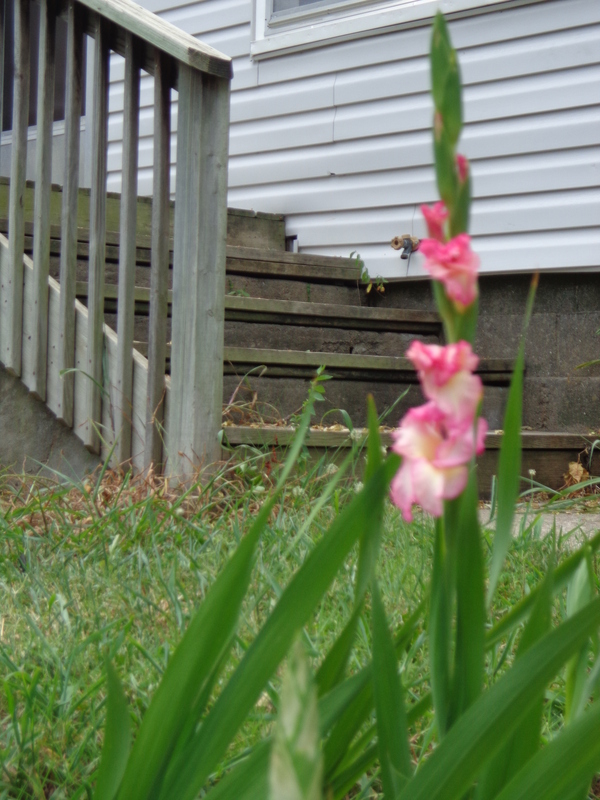 My first gladiolus blossom from scratch! Not much of a gardener (hard to do with the ivy finding me all the time, but maybe that’s gone now – hopeful thinking). Just had a fabulous time with my quilt guild for show & tell our works in progress. I think I ‘brought’ the most of everyone. Doesn’t mean I have the most WIP’s though. But I still found myself nervous in front of a crowd. Funny how that is.